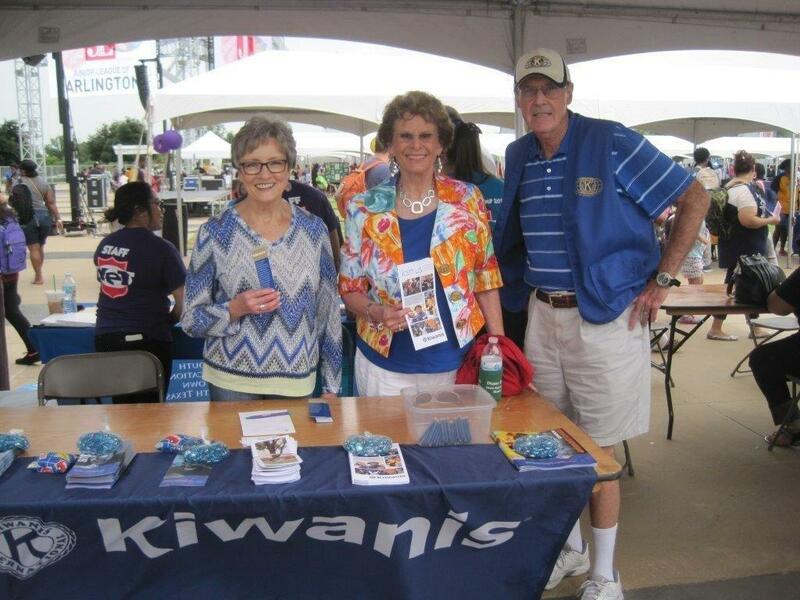 For the third year in a row, the Kiwanis Club of Arlington showed its support for the Arlington Independent School District by taking part in AISD’s Back to School Kickoff at AT&T Stadium, home of the Dallas Cowboys, on Saturday, Aug. 12. The Kickoff, now in its third year, is a community effort to help more than 10,000 Arlington ISD students and their families prepare for the coming school year. The Kiwanis Club of Arlington was one of several Arlington organizations invited to talk with students and parents and provide information about programs and activities that help students grow and achieve. Kiwanis volunteers staffed a table at the west entrance of AT&T Stadium and provided materials about high school Key Clubs and many other Kiwanis Service Leadership Programs. The team included President-Elect Bob Landon, Diane Rasmussen, and Al and Doris Becker. At the AISD Kickoff, pre-registered students received a backpack filled with school supplies appropriate to their grade level. Students had the opportunity to register for immunizations, vision checks, dental screenings and haircuts. Students and parents also visited the more than 100 resource booths that were on site, including the Kiwanis booth. The event was hosted by the Arlington ISD and co-hosted by the Arlington NAACP, Junior League of Arlington, Churches of Arlington, The Gene and Jerry Jones Family North Texas Youth Education Town, and the Gene and Jerry Jones Family Arlington Youth Foundation. The Gene and Jerry Jones Family Arlington Youth Foundation donated a $50,000 grant, as well as the use of AT&T Stadium as the event’s venue. Kiwanis Club of Arlington meets Wednesdays at 12:00 p.m. at First United Methodist Church, 313 N. Center Street in Arlington. Our brochure puts all our information in one place, making it easier for you to share Kiwanis with those around you. Content © 2019 Kiwanis Club of Arlington. Powered by Wordpress.